Biofilms are an alternative growth state of bacteria, represent two thirds of all infections, and are resistant to antimicrobial treatment being 10- to 1,000 fold more resistant to most antibiotics. This resistance is adaptive in that it depends on the biofilm growth state and although many explanations have been provided to explain it, it is likely that changes in gene and/or protein expression in the biofilm state explain why organisms become resistant. Intriguingly despite this problem, not a single antibiotic has been developed for treating biofilms. We have started to address this using as templates the cationic host defence (antimicrobial) peptides, which are produced by virtually all organisms as a major part of their innate defences against infection. They are a key component of innate immunity and have multiple mechanisms that enable them to deal with infections and inflammation, including selective modulation of innate immunity, activity against bacterial biofilms (the cause of 65% of all human infections) and direct antimicrobial activity. We made the breakthrough observation that human peptide LL-37 was able to inhibit Pseudomonas aeruginosa biofilms at one sixteenth of its MIC concentration. This led us to extensively pursue synthetic peptides. Peptides act against biofilms formed by multiple species of bacteria in a manner that is independent of activity vs. planktonic bacteria. 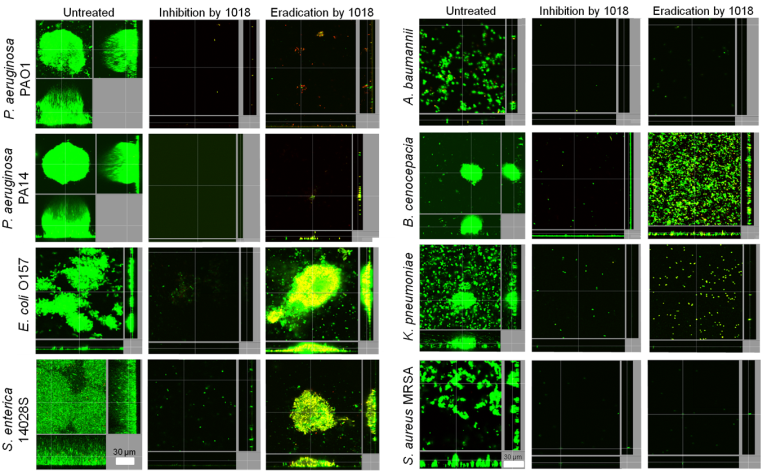 We have now developed novel 12-amino-acid anti-biofilm peptides that (i) kill multiple species of bacteria in biofilms (MBEC change to minimal biofilm eradication concentration < 1μg/ml), including P. aeruginosa and other major clinically relevant Gram negative and Gram positive bacteria, including the ESKAPE pathogens, (ii) work synergistically with antibiotics in multiple species, and (iii) are effective in animal models of biofilm infections. Structure activity relationships studies showed no major overlap between anti-biofilm and antimicrobial (vs. planktonic bacteria) activities and indeed organisms completely resistant to antibiotic peptides were still able to be treated with anti-biofilm peptides. The action of such peptides is dependent on their ability to trigger the degradation of the nucleotide stress signal ppGpp. QSAR analysis of hundreds of such peptides combined with machine learning methods clarified the structural characteristics, “descriptors”, involved in anti-biofilm peptide activity and enabled the relatively-accurate virtual design of new peptides. Intriguingly there was some overlap between anti-biofilm and immunomodulatory peptides and it was possible to design good anti-biofilm peptides that either promoted protective immunity or suppressed potentially harmful inflammation or both.